While I am quite behind on my various writing projects, I haven’t been completely idle! I’ve been working on completing my Torg: Eternity character generator, and I think it is now basically done. At least until the splatbooks start coming out! It can now do character generation and advancement by XP, as outlined in the rulebook that hasn’t been published yet as of this writing. 🙂 It does PCs, it does NPCs, it outputs stat blocks to text or PDF. Furthermore, the game data (skills, perks, items, and whatnot), the character generation settings (how many points players have to spend, etc. ), and even how much it costs to advance the character’s numbers can all be customized. All in all, it’s a spiffy little piece of software, if I do say so myself! All that time I spent on the Kindom Manager application really paid off; I can almost design these kinds of systems out in my sleep at this point (the actual coding, that takes much longer…). I hope that when the game is published for real, groups will find this to be a handy little tool for their games. 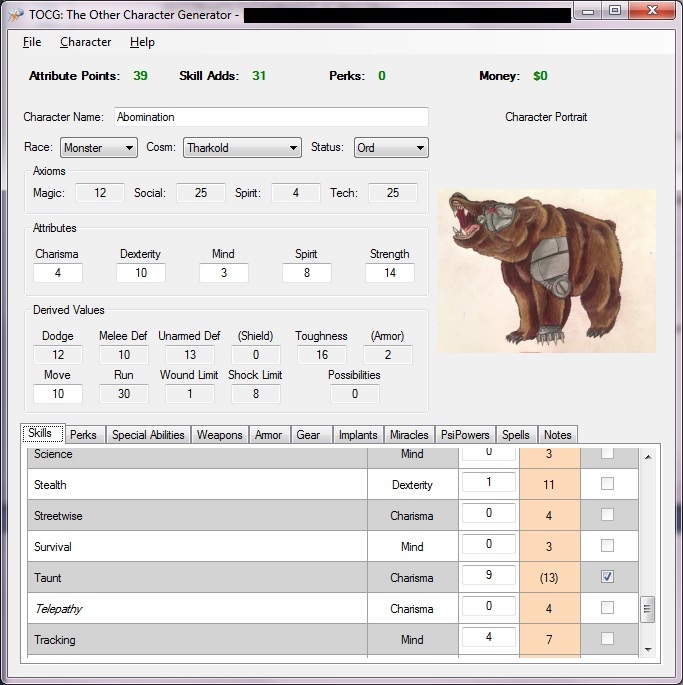 Once character generation is complete for a particular PC, the program enters “XP Mode” by default, where XP is required to change the character’s stats or add new perks. This can be switched to “Free Spend Mode” in the Character menu, which allows one to change things willy-nilly. But to keep the user from needing to switch back and forth a bunch, I codified common game events that would cause a character’s stats or inventory change outside of regular advancement. 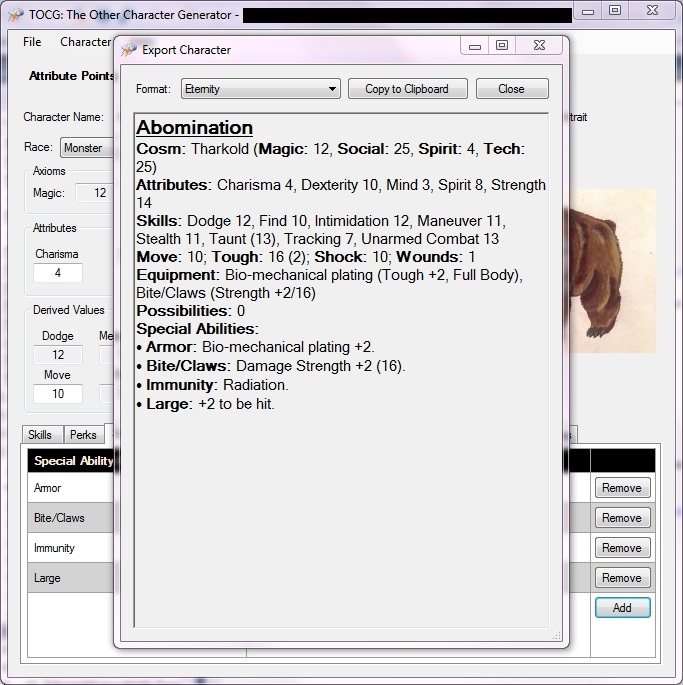 These “Character Events” include losing an add from the Reality skill due to reconnection mishaps, losing a point of Charisma from failing a Corruption test, gaining a Corruption perk, or even finding a random magic item or having an item spontaneously enchanted in Asyle. Customization is a bit tricky since it involves modifying XML files (or not, if you’re familiar with HTML or XML). There are some Readme documents in the install directory that give some instructions to get one started on that front. But please don’t modify the files in the Data directory! Or else they’ll be lost if you install an update. Customizations go in the CustomData directory, and there are some example files there. The latest version is 1.0.5.5. It can be downloaded here. Wow, this is pretty awesome. Thank you for sharing this!